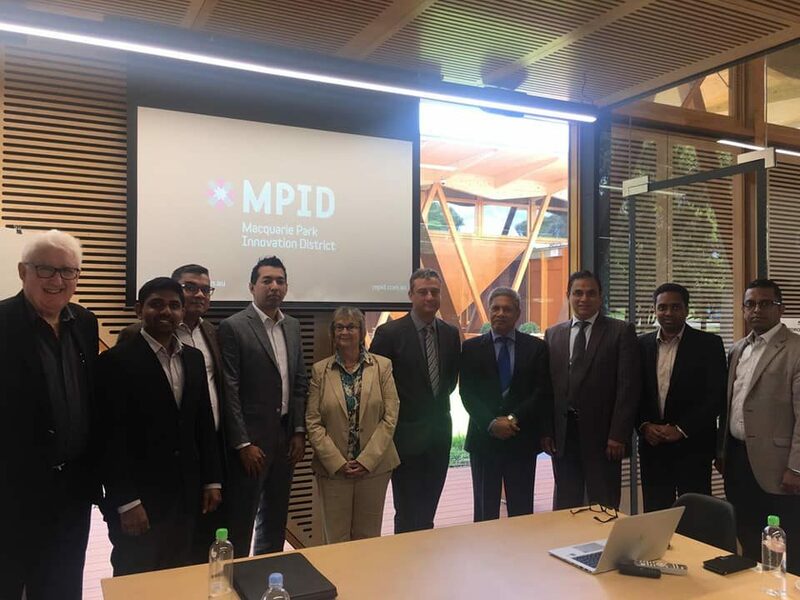 Sydney (Press Release): In collaboration with the Consulate General of Sri Lanka in Sydney, seven IT-BPM companies led by Information and Communication Technology Agency (ICTA) visited Sydney from 28 – 30 November 2018 on an accelerated market access programme to facilitate and support the IT industry in Sri Lanka. Under the Economic Diplomacy Program initiated by the Ministry of Foreign Affairs, the Sri Lankan Consulate General in Sydney had arranged Business Networking for the visiting IT Delegation on 28 November. The main objectives of the networking event were to showcase Sri Lanka’s knowledge services industry as well as to present opportunities available for Australian software companies to collaborate with Sri Lankan counterparts. Consul General Lal Wickrematunge, Consul Commercial Abdul Raheem and ICTA Project Manager spoke at the event and the members of the visiting delegation had an interactive session with invited companies. The Consulate General also arranged a familiarization visit for the deligation to the Computer Department of the Macquarie University on 30 November 2018. Presentations were made by Prof. Christophe Doche, Executive Director/Optus Macquarie University Cyber Security Hub, Prof. Margarat Hudson, Director Macquarie Park Innovation District and Prof. Michael Sheng, Head of the Computer Department. Members of the Sri Lankan IT Delegation were briefed on ongoing IT innovations in Australia. In association with Thesalesdesk, a Consultancy Agent, ICTA also arranged a matchmaking meetings and B2B sessions for the Sri Lankan companies on 29 November 2018. ICTA Project Manager Sachindra Samararatne made a detailed presentation on IT industry sector in Sri Lanka and opportunities available for Australian companies to partner with Sri Lankan counterparts. Joe Collins, Managing Director of CAMMS who has his business operations in Sri Lanka spoke about his experience in running a business venture and the enabling environment in the country. Sri Lanka’s IT and BPM sector tripled exports and doubled the workforce in the last five years. Total earnings from the ICT sector amounted to $920 million in 2017, an 8 percent growth over the previous year and became the fifth largest export segment. The software services sector includes telecommunications, banking, financial services and insurance (BFSI) and software testing. The BPO sector includes financial & accounting services, investment research, engineering services, and UK-based legal services. Sri Lankan IT delegation to Sydney included Softcodeit Solutions Ltd, 27/7 Techies Pvt. Ltd., Inexis Consulting, hSenid Business Solutions, PayMedia Pvt. Ltd., i-Context Content Convergence Pvt. Ltd., Data Management Systems Pvt. Ltd, and Project Managers Nilan Thimbiripola and Sachindra Samararatne of ICTA.